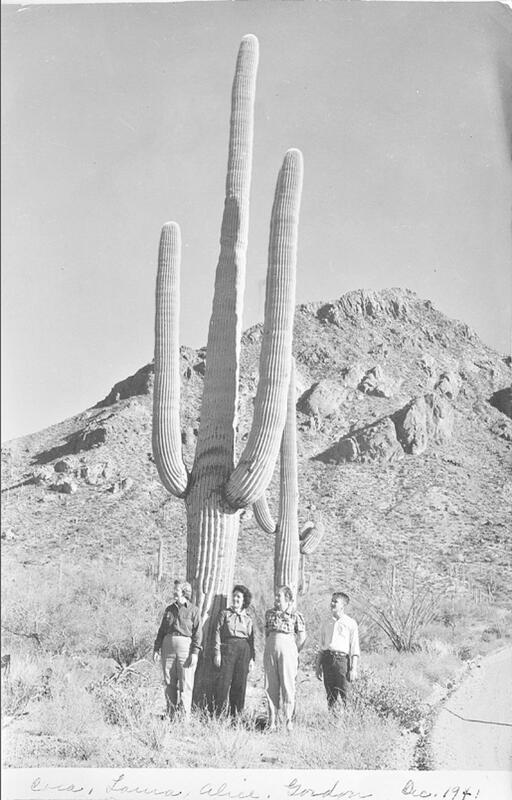 Comments: Cora Margaret Perrine (Nee: CORMENY) | Tanque Verde AZ USA | 1941-1960 | Comments: Photo taken by Maurice C. PERRINE, December 1941 in Tucson [Arizona] Mountains. Subjects LtoR: Cora Margaret CORMENY Curtright Perrine (1890-1983); Laura, friend of Cora; Alice Amanda CORMENY Udey Fruhof (1884-1976), sister of Cora; Gordon, son of Cora & Maurice. To compare this photo with a closer detail, use KEY WORD Search by entering only the following number: 78577.